Fountain Square, Arcue Building in background. In 1983, Newsweek featured Springfield in its 50th anniversary issue, entitled, "The American Dream." It chronicled the impact of the past 50 years on five local families. In 2004, Springfield was chosen as an "All-America City". In 2011, Springfield was named the "unhappiest city in America" by the The Gallup Organization after a three-year survey. 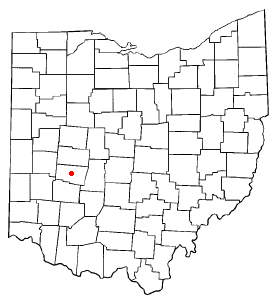 The villages of Peckuwe and Piqua were located near today's Springfield, Ohio, at 39° 54.5′ N, 83° 54.68′ W and 39° 54.501′ N, 83° 54.682′ W respectively, and were home to the Peckuwe and Kispoko Divisions of the Shawnee Tribe until the Battle of Piqua, August 8, 1780. The Piqua Sept of Ohio Shawnee Tribe have placed a traditional cedar pole in commemoration, located "on the southern edge of the George Rogers Clark Historical Park, in the lowlands in front of the park's 'Hertzler House.'" Springfield was founded by James Demint, a former teamster from Kentucky, in 1801. When Clark County was created from parts of Champaign, Madison and Greene counties, Springfield, named for Springfield, Massachusetts – which, at the time, was important for hosting the U.S. Federal Springfield Armory; enduring the Attack on Springfield during King Phillip's War in 1675,; and Shays' Rebellion in 1787. Springfield beat out the village of New Boston as the county seat in 1818. by two votes in the state legislature. Springfield traces its early growth to the National Road, which ended in Springfield for approximately 10 years as politicians wrangled over the path it would continue. Dayton and Eaton wanted the road to veer south after Springfield, but President Andrew Jackson made the final decision to have the road continue straight west to Richmond, Indiana. During the mid-and-late 19th century, Springfield was dominated by industrialists including Oliver S. Kelly, Asa S. Bushnell, James Leffel, P. P. Mast and Benjamin H. Warder. Asa S. Bushnell built the Springfield, Ohio Bushnell Building where the patent attorney to the Wright Brothers, Harry Aubrey Toulmin, Sr., wrote the 1904 patent to cover the invention of the airplane. To promote the products of his agricultural equipment company, P. P. Mast started the Farm and Fireside magazine. Mast’s publishing company – Mast, Crowell, and Kirkpatrick – grew to become Crowell-Collier Publishing Company best known for Collier's Weekly. In 1894, The Kelly Springfield Tire Company was founded. At the turn of the 20th century Springfield became known as the "Home City." Several lodges including the Masonic Lodge, Knights of Pythias and Odd Fellows built homes for orphans and aged members of their order. Springfield also became known as "The Champion City"..a reference to the Champion brand of farm equipment manufactured by the Warder, Bushnell & Glessner Company, which was later absorbed into International Harvester in 1902. International remains in Springfield as Navistar International, a producer of medium to large trucks. In 1902 A.B. Graham, then the superintendent of schools for Springfield Township in Clark County, established a "Boys' and Girls' Agricultural Club." Approximately 85 children from 10 to 15 years of age attended the first meeting on January 15, 1902 in Springfield, Ohio, in the basement of the Clark County Courthouse. This was the start of what would be called the "4-H Club" within a few years, quickly growing to a nationwide organization. (4-H stands for "Head, Heart, Hands, and Health"). The first "projects" included food preservation, gardening and elementary agriculture. Today, the Courthouse still bears a large 4H symbol under the flag pole at the front of the building to commemorate its part in founding the organization. The Clark County Fair is the second largest fair in the state (only the Ohio State Fair is larger) in large part to 4H still remaining very popular in the area. On March 7, 1904, over a thousand Springfield residents formed a lynch mob, stormed the jail and removed prisoner Richard Dixon, a black man accused of murdering police officer Charles B. Collis. Richard Dixon was shot to death and then hung from a pole on the corner of Fountain and Main Street, where the mob continued to shoot his lifeless body. The mob then proceeded to burn much of the black area of town. In February 1906, another mob formed and again burned the black section of town known as "the levee". Sixty years later, Springfield was the first city in the US to have a black mayor, Robert Henry. From 1916 to 1926, 10 automobile companies operated in Springfield. Among them: The Bramwell, Brenning, Foos, Frayer-Miller, Kelly Steam, Russell-Springfield and Westcott. The Westcott, known as the car built to last, was a six-cylinder four-door sedan manufactured by Burton J. Westcott of the Westcott Motor Car Company. Burton and Orpha Westcott however, are better known for having contracted the world-renowned architect Frank Lloyd Wright to design their home in 1908 at 1340 East High Street. The Westcott House, a sprawling two-story stucco and concrete house has all the features of Wright's prairie style including horizontal lines, low-pitched roof, and broad eaves. It is the only Frank Lloyd Wright prairie style house in the state of Ohio. The property was purchased in 2000 by the Frank Lloyd Wright Building Conservancy (Chicago, IL), and as part of a prearranged plan, the house was then sold to a newly formed local Westcott House Foundation. The Westcott House Foundation managed the extensive 5-year, $5.3 million restoration, the house was fully restored to its original glory in October 2005, when it officially opened to the public for guided tours. International Harvester (now Navistar), manufacturer of farm machinery and later trucks, became the leading local industry after Springfield native William Whiteley invented the self-raking reaper and mower, in 1856. It held that position, along with Crowell-Collier Publishing, throughout most of the next century. The city is served by one daily newspaper, the Springfield News-Sun, and by one weekly newspaper, The Springfield Paper. Springfield is located at 39°55′37″N 83°48′15″W﻿ / ﻿39.92694, -83.80417 (39.927067, −83.804131). According to the United States Census Bureau, the city has a total area of 25.50 square miles (66.04 km2), of which, 25.29 square miles (65.50 km2) is land and 0.21 square miles (0.54 km2) is water. The Clarence J. Brown Reservoir is located on the northeast outskirts of Springfield. As of the 2000 census, the median income for a household in the city was $32,193, and the median income for a family was $39,890. Males had a median income of $32,027 versus $23,155 for females. The per capita income for the city was $16,660. 16.9% of the population and 13.5% of families were below the poverty line. Out of the total population, 23.9% of those under the age of 18 and 9.6% of those 65 and older were living below the poverty line. As of the 2010 census, there were 60,608 people, 24,459 households, and 14,399 families residing in the city. The population density was 2,693.7 people per square mile (1,039.6/km²). There were 28,437 housing units at an average density of 1,263.9 per square mile (487.8/km²). The racial makeup of the city was 75.2% White, 18.1% African American, 0.3% Native American, 0.8% Asian, 0.02% Pacific Islander, 4.0% from two or more races. Hispanic or Latino of any race were 3.0% of the population. There are 24,459 households of which 26.3% have children under the age of 18 living with them, 34.4% are married couples living together, 18.6% have a female householder with no spouse present, 5.9% have a male householder with no spouse present, and 41.1% are non-families. 34.1% of all households are made up of individuals and 13.7% have someone living alone who is 65 years of age or older. The average household size is 2.38 and the average family size is 3.01. In the population is spread out with 24.4% under the age of 18, 11.5% from 18 to 24, 24.2% from 25 to 44, 24.6% from 45 to 64, and 15.3% who are 65 years of age or older. The median age is 36 years. For every 100 females there are 90.9 males. For every 100 females age 18 and over, there are 86.2 males. Springfield Public Schools enroll 8,604 students in public primary and secondary schools. The district operates 16 public schools including ten elementary schools, three middle schools, one high school, and one alternative school. Springfield is also home to Nightingale Montessori, a small private school using the methods from Dr. Montessori. The school was founded over thirty years ago, and has been educating many from Springfield, Clark County and other surrounding counties such as Greene, Clinton, Champaign, Franklin, Madison and Logan. The school accepts the Ed Choice scholarship, The Jon Peterson Scholarship and the Autism Scholarship. Students are admitted as early as 2 1/2 years old through high school. Springfield is home to two institutions of higher learning, Wittenberg University and Clark State Community College. 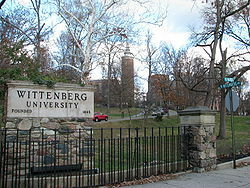 Wittenberg University is a Lutheran University that was founded in Springfield in 1845. It is a four-year private liberal arts university. It has more than two thousand students and a faculty of more than one hundred ninety five. It is situated on a campus of one hundred and fourteen rolling acres, shaded by many majestic trees. It is one of the most highly rated liberal arts universities in the nation, offering more than seventy majors, which include those in the sciences as well as in the arts. Wittenberg has more than one hundred fifty campus organizations, which include ten national fraternities and sororities. It has its own WUSO radio station and newspaper. The University is best known for its music department and its athletic endeavors. Wittenberg is also distinguished by its strong interdisciplinary programs such as East Asian Studies and Russian Area Studies. Recently majors in Management, Communication, Education are also becoming popular. The University made major renovations to its science facilities with the opening of the Barbara Deer Kuss Science Center in 2003. The city is also home to Clark State Community College. Clark State Community College was founded in 1962 under the name of the Springfield and Clark County Technical Education Program as a technical education college for Clark County, Ohio and the surrounding area. It changed its name in 1966 to Clark County Technical Institute. The Ohio Board of Regents accredited it as Ohio's first technical college. It is now called Clark State Community College and has more than one thousand students. It offers courses in business, health, public services, engineering technologies, agriculture and general studies. In the 1950 film Pagan Love Song, starring Esther Williams, actor Howard Keel; played Hap "Hazard" Endicott, a school teacher from Springfield, Ohio. In 2009, during a scene of the movie X-Men Origins: Wolverine, "Springfield, Ohio" is listed in the scene caption as the location of a carnival where Victor Creed/Sabretooth finds Chris Bradley/Bolt working as a game booth attendant. The Springfield News-Sun, The Wittenberg Torch, WEEC-FM radio, WUSO-FM radio are the city's main media organizations. PBS' Market Warriors is scheduled to air an episode on September 17, 2012 featuring the Springfield Antique Show and Flea Market. Luther Alexander Gotwald Prof., D.D. – tried for and acquitted of Lutheran heresy at Wittenberg College in 1893. Bradley Kincaid -America's first country music star. He performed on WLS, WBZ, and WLW. Robert Bruce Raup – Professor, Teachers College, Columbia University, writer, and critic of American Education system. Alaina Reed Hall – television actress, "227 (TV series)" and "Sesame Street"
Clark County Heritage Center, which houses the Clark County Historical Society museum, library, and archives. Clark County Public Library, which has its main and two other branches in Springfield. ^ "American FactFinder". United States Census Bureau. http://factfinder2.census.gov/faces/nav/jsf/pages/index.xhtml. Retrieved 2013-01-06. ^ "Profile of General Population and Housing Characteristics: 2010". U.S. Census Bureau. http://factfinder2.census.gov/faces/tableservices/jsf/pages/productview.xhtml?pid=DEC_10_DP_DPDP1. Retrieved 2013-01-27. ^ McGinn, Andrew (January 12, 2012). "City rejects ‘unhappiest’ label as old, unfit". Springfield News-Sun. http://www.springfieldnewssun.com/news/springfield-news/city-rejects-unhappiest-label-as-old-unfit-1309015.html. Retrieved 2012-03-19. ^ "Peckuwe Shawnee Memorial Marker". HNdb.org, The Historical Marker Database. http://www.hmdb.org/marker.asp?marker=35274. Retrieved 2013-02-17. ^ "The Battle of Piqua Marker". HMdb.org, The Historical Marker Database. http://www.hmdb.org/Marker.asp?Marker=35171. Retrieved 2013-02-17. ^ "Ghost Towns: New Boston". www.springfieldohio.net. 2012-01-27. http://www.springfieldohio.net/history/ghost-towns/new-boston.php. Retrieved 2013-01-27. ^ "Mob in Ohio Shoots...". New York Times. March 8, 1904. http://query.nytimes.com/gst/abstract.html?res=9B01E6D9103BE631A2575BC0A9659C946597D6CF&scp=4&sq=springfield+ohio&st=p. ^ Great Schools.com. "Springfield City School District Profile". http://www.greatschools.net/cgi-bin/oh/district_profile/150. Retrieved 2008-10-06. ^ "Database of Movie Dialogs (line 141)". 2011 BelaZebra. http://movie.subtitlr.com/subtitle/show/570822. ^ "Market Warriors Visits Springfield". http://www.pbs.org/wgbh/market-warriors/watch-online/previews/antiquing-springfield-oh-preview-2/. ^ "Clarke, Lewis Strong". Louisiana Historical Association, A Dictionary of Louisiana Biography (lahistory.com). http://www.lahistory.org/site20.php. Retrieved December 21, 2010. ^ "Kragujevac Twin Cities". ©2009 Information service of Kragujevac City. http://www.kragujevac.rs/Gradovi_prijatelji-59-1. Retrieved 2009-02-21. This page uses content from the English language Wikipedia. The original content was at Springfield, Ohio. The list of authors can be seen in the page history. As with this Familypedia wiki, the content of Wikipedia is available under the Creative Commons License.